[fusion_text]Need Help? Call us on 0161 776 9832 or drop us an email for expert pest control advice on how to identify pest infestations and help solve your problem. Though moths tend to look very different in appearance and size, the visual aspect is as far as it goes. Your typical moth has two wings, each covered in fine scales which, depending on the moth, may be spectacularly colourful, or quite dull, being composed mostly of greys and browns. The kind of moth you’re likely to find in your home will be under an inch in size and quite dull in colour. Though moths are more or less built the same in spite of their visual differences, their behaviour and diet is as varied as their colours. For example, certain moths can be a significant problem for agriculture, while others cause little to no problems for people save for the occasional fright. Some moths serve an important role in pollinating various plants, while others simply feed on the blood of animals. Of course, they serve as a food source for many larger animals of all types, from lizards to spiders. In the home, you’re most likely to find a moth nibbling at your stored food, something that the Brown House Moth Hofmannophila pseudospretella is known for! Moths have built themselves something of a bad reputation for eating away at clothing (such as the Common Clothes Moth Tineola bisselliella) that has spent a long time in the cupboard, but in truth, moths will ruin just about anything, including fur and feathers, especially if the moth is a Case-Bearing Clothes Moth Tinea pellionella. Despite a penchant for flying into light bulbs, moths actually prefer the dark, and will often be found in places like closets, and attics, snoozing away in bits of fabric, such as curtains or old clothing. Due to their largely sedentary nature, they can often grow to substantial numbers in a location before ever being noticed by a person. 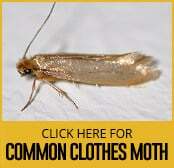 The kind of moth that eats your favourite jumper is known as Common Clothes Moth Tineola bisselliella, or a webbing cloth moth, and it is actually their larvae that does the damage, not the grown moth itself. They are picky though, preferring animal based clothing such as woolly jumpers over their synthetic counterparts. Other than the aforementioned wardrobe-ruining activities, moths are generally considered to be harmless to people directly, though they can be annoying and a not insignificant number of people will be scared of them. Despite this perception, some moths are more troublesome, such as the saddleback caterpillar moth, the Io moth, and the southern flannel moth, as their larvae can actually sting! The biggest area of concern over moth behaviour is in agriculture, though, where a significant moth infestation can cause serious damage to crops. Diamondback moths, Codling moths, and Gypsy moth caterpillars are a nightmare to cabbage, fruit, and forested areas respectively. Other moth larvae (known as cotton bollworms, tomato fruitworms, and corn earworms) have been known to consume tomato, cotton, and corn. This is also something the Brown House Moth Hofmannophila pseudospretella is known for. Aside from the most obvious method of flying through an open door or window, moths can also find their way into your home via an infested medium that is brought in, such as food products, plants, or clothing. Plants especially are susceptible to White-Shouldered House Moth Endrosis sarcitrella, which eat plantlife and other organic debris. A good starting point for preventing moths from getting into your home is to check over food that is being brought into the house, that goes double for grain-based food stuff and pet food. 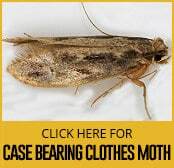 Be sure to check any fabrics entering the house, be they clothes, rugs, furniture, etc, the latter being more the purview of the Case-Bearing Clothes Moth Tinea pellionella. It may also help to limit the use of outdoor lighting as much as is feasible as the lights tend to attract moths at night time. 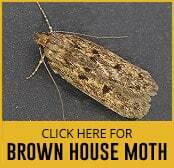 Unfortunately, a lot of the signs of a moth infestation are only detectable after the infestation is underway, and the signs vary depending on what species of moth you are dealing with. For example, typical indoor moths can be seen by the adults flying around the room, whereas moths that eat fabric tend to be noticed by the mess they make of your wardrobe. 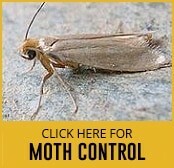 Plant-eating moths such as the White-Shouldered House Moth Endrosis sarcitrella can be noticed by the damage caused to plant life around the house. Sometimes webbing or droppings may be noticed as well.